Google Currents is an app for Androind and iOS, which will help you to read online magazines and other contents. It was available for US only when it is launched. 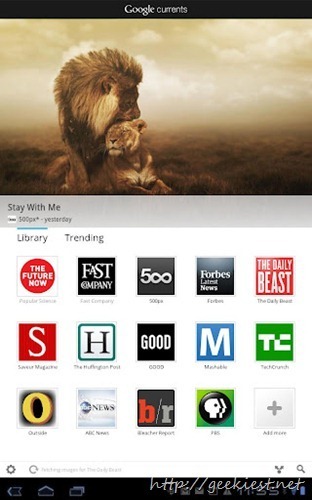 Google announced the availability of Google currents Internationally. After the U.S. launch, the top features readers requested were to make the app available internationally and to allow content to sync quickly. We’ve heard you, and today we’re making Google Currents 1.1 available around the world. Whatever you’re interested in -- whether it’s science (Popular Science, Scientific American, Space.com), sports (Bleacher Report, CBS Sports, Surfer), business (Harvard Business Review, Inc.), celebrities (Celebuzz, HollywoodLife, Now magazine, TMZ), health & wellness (Men’s Health, Yoga Journal), design (Colossal, Dwell) or news (The Atlantic, PRI, Slate) -- it’s easy to find a great edition to read in Google Currents.